This black Kurt Cobain with sunglasses t-shirt is amazing for all the fan. The women’s t-shirt is available in women’s sizes Small – 2XL. 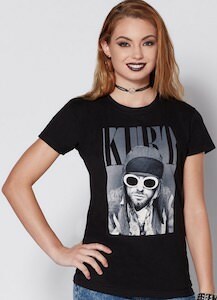 On the shirt, you can see a picture of Kurt Cobain and he is wearing some cool sunglasses and on the top of the image in the background, it says “Kurt”. So show the world that you are not forgetting Kurt and also showing people that you still like his music and wearing a shirt like this is a great start. If you want an amazing Maddona shirt then you just have to check out this blue Madonna t-shirt. The white shirt is made from men that really like the music star. On the shirt, you can see a nice photo of Madonna but it blue instead of black and white and that really looks special and kinda cool. Besides Madonna, it also has her name next to you. And this shirt is made from 100% cotton and comes in men’s sizes Small – 3XL so that you can have a perfect size. And sure it is a men’s cut shirt but that does not mean that it would not look great on women. 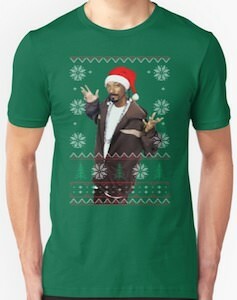 If you like some rap music then you may like this Snoop Dogg Christmas t-shirt. The shirt is made for men and women and comes in many colors and styles and comes in sizes Small – 3XL and if you like a Christmas sweater then you can get it as a Snoop Dogg Christmas sweater too. On the shirt, you can see Snoop Dogg while wearing a cool red hat just like Santa Claus and he is his hand in the air just to tell you how cool he looks. On top of the image of Snoop, you can find many Christmas details like stars, and trees. So be ready for the holiday in Snoop Dogg style! Now there is this Katy Perry making breakfast t-shirt and that would be every fans dream if she would do that for you. The shirt shows Katy Perry in the kitchen while juicing and she is wearing just a bra and shorts and that makes your dreams about doing breakfast with Katy even stronger. Besides the black and white image of Kary Perry, it says in red her name on it too. The Katy Perry t-shirt is available in men’s sizes Small – 3XL and is made from 100% cotton. Show the world that you like breakfast and Katy Perry by simply wearing this fun t-shirt. 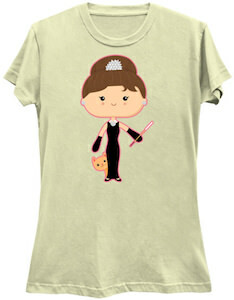 If you have seen Breakfast At Tiffany’s then you will like this cute t-shirt. On the t-shirt you can see in a cartoon style a picture of Audrey Hepburn in a nice black dress and hiding behind her legs you can see the orange cat from the movie. The Audrey Hepburn t-shirt is something different as it is not the usual picture but more like a cartoon and that makes it special and perfect for a collector and fan like yourself. You can get this Audrey Hepburn t-shirt in many colors and styles for both men and women and it comes in sizes Small – 6XL. 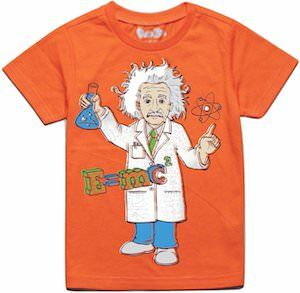 Now there is this Einstein science rocks t-shirt and it just looks fun. The t-shirt is available in a bunch of colors and in style for both men and women in sizes Small – 6XL. 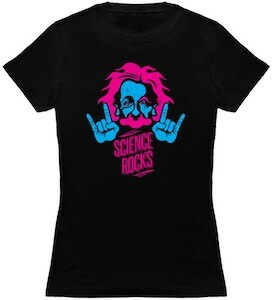 On the t-shirt, you can see Albert Einstein with below his face the text “Science Rocks” and all the design is bright pink and light blue making it really stand out especially on the black shirt like you see on the picture. So if you think science is amazing then a shirt that says so and that shows Einstein as he was such an amazing scientist is just what you need. Madonna’s Who’s That Girl world tour was in 1987 and you can now have the t-shirt to remember that. 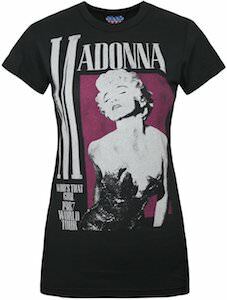 This women’s t-shirt is black and on it, you can see Madonna against a purple background and around it, you find the text “Madonna Who’s That Girl 1987 World Tour”. You can get this Madonna t-shirt in women’s sizes Small – XL and it is officially licensed so you know that it is just like Madonna wants it to be. No more waiting for your perfect Madonna t-shirt as this is just what every true fan just needs to have it its collection. Now there is a great tribute t-shirt for the female fans of George Michael. This women’s t-shirt is white and on it, you can see a portrait of George Michael with stars in his hair and below the face, it says “George Michael Choose Life”. 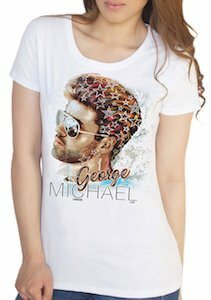 You can get this amazing looking George Michael in women’s sizes Small – 2XL and I am sure that it will bring back memories to this amazing musician and even Wham. So show the world around you George Michael by wearing this cool t-shirt.